Maleficent is a 2014 dark fantasy adventure film directed by Robert Stromberg from a screenplay written by Linda Woolverton. 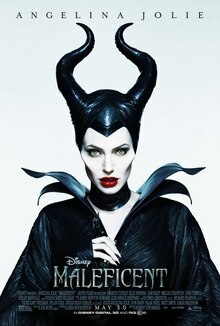 Starring Angelina Jolie as the eponymous Disney villainess character, the film is a live-action re-imagining of Walt Disney‘s 1959 animated film Sleeping Beauty, and portrays the story from the perspective of the antagonist, Maleficent. Review: So, let me get this clear remove any ideas you have of the original Sleeping Beauty. Are they gone yet? Okay so now that you cannot remember what happened, this story will mystify you. First the effects, they are truly stunning. The world they have created is so real and magical looking that I wouldn’t be averse to a walk in those woods. The faeries are animated with facial expressions and their own characteristics. The animators have managed to create this fantastically real world where the story is set. I honestly think that the work in the world building and imagery is the strongest part of this film. So, the film opens with a young winged elven girl in a tree, who is Maleficent. She is a well loved girl within the magical community within the Moors and shows huge magical promise. It is her that meets with the young human thief. As you can imagine this bloomed into a a romance where she and Stefan shared “True Loves first Kiss”. Unfortunately for her, human greed plays it part and Stefan’s ambition to be king plays a part in his betrayal of Maleficent. Ever the scorned woman that she is, she places a curse on his first born girl who will prick her finger at 16 and fall in an enchanted death-like sleep until True Loves kiss awakes her. So, who takes care of Aurora? Well the three little faeries, Thistlewit – Juno Temple, Knotgrass – Imelda Staunton and Flittle – Lesley Manville. These three actresses are quite well known. Imelda, for me is the hateful Professor Umbridge from the Harry Potter series. This incarnation is a stubborn, self assured faerie. Juno Temple typically plays quite ditzy characters and this is no exception, Thistlewit is very out-there and isn’t as series as her fellow faeries. Finally Lesley Manville is also a very confident faerie who always seems to turn things around her blue for a time. These three successfully create the trio of faeries who don’t have the first clue about looking after a child. This is the bases of how Aurora and Maleficent are brought together. Maleficent in hoping to see her curse crush Stefan, makes sure Aurora lives and grows older, creeping towards her 16th Birthday until her eventual cursed sleep. Angelina Jolie plays a very diverse character. From displaying her love and excitement to her darker, more hateful moments. She is able to deliver all this with the appropriate tone and body language, she also delivers Maleficent’s deadpan human too perfection which makes the audience laugh. Jolie manages to perfect the visual of the growing bond between herself and Aurora, making the audience know of her fondness for the child of the man she despises. It is because of this mastery in acting that we see Maleficent develop into the character we see at the end of movie, where she becomes her true self. My only personal issue with Jolie’s portrayal is her accent, it sounds as if she has attempted to impersonate an English accent. Elle Fanning plays the beautiful soul that is Aurora. She has the ability to love all those around her and seem unable to truly hate anyone. She portrays Aurora as a person who loves to find out more and isn’t afraid of what she doesn’t know. She is also well aware that her “Aunties” are incapable of looking after her properly but love her too pieces. It is this portrayal that makes you understand how Maleficent could feel such a bond with her and ultimately regret cursing her as a child. The whole story winds upto the final 20 minutes or so, where Maleficent and Aurora show the world who they are against Stefan and his army. This final battle is visually stunning with Dragon’s, flying and a great big helping of True Love. We get to understand just how Maleficent is both a Hero and a Villain. I guess I will mention my personal dislikes with this movies. – It could have been so much better. There was a large portion of this film, that just didn’t progress with the story or would stall on an irrelevant issue. – The story line and where it is going is far too obvious. Think of Disney’s Frozen. Overall I would give this film a firm 3.5/5 stars. It is a very nice cinematic experience where the actors all help lift the story line and make it an entertaining film. Unfortunately the issues for me would not encourage me too see it again in the cinema, which personally, a film should make you want to go back and see it again. Yet, it does make you smile. Definitely.